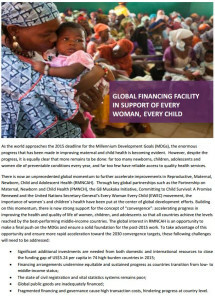 The World Bank Group and Governments of Canada, Norway, and the United States announced today that they will jumpstart the creation of an innovative Global Financing Facility (GFF) to mobilize support for developing countries’ plans to accelerate progress on the health-related Millennium Development Goals (MDGs) and bring an end to preventable maternal and child deaths by 2030. The GFF, in support of Every Woman Every Child, is being developed in close collaboration with a broad range of stakeholders, including partner countries; the H4+ agencies (UNICEF, UNFPA, WHO, UNAIDS, UN Women and the World Bank Group); civil society organizations; bilateral and multilateral development partners; foundations; private sector and others working in the areas of reproductive, maternal, newborn, child and adolescent health. The GFF will support countries in their efforts to mobilize additional domestic and international resources required to scale up and sustain essential health services for women, children and adolescents. The initial donor commitments to the World Bank Group for the GFF include grants in the amounts of $600 million from Norway and $200 million from Canada. The GFF resources will be provided to countries in conjunction with low-interest loans and grants from the International Development Association (IDA), the World Bank Group’s fund for the poorest countries. Based on strong country demand for health results-based financing programs, these bilateral contributions could leverage up to an estimated $3.2 billion from IDA, for a total of up to $4 billion in financing to support MDG acceleration and improve reproductive, maternal, newborn, child and adolescent health. The U.S. Agency for International Development (USAID), on behalf of the United States, is committed to working with partners to establish the GFF, bringing its full arsenal of innovative financing mechanisms and public-private partnerships to the collaboration. Aligning USAID’s support through these complementary mechanisms could bring upto $400 million in leveraged resources to these efforts. The support to create the GFF was announced by global leaders at the high-level event for Every Woman Every Child during the 69th UN General Assembly. The GFF will be designed to support the goals of the Every Woman Every Child global movement and the Global Strategy for Women’s and Children’s Health, launched by UN Secretary-General Ban Ki-moon during the UN Millennium Development Goals Summit in September 2010, and supported by the G-8 Muskoka Initiative on Maternal, Newborn, and Child Health, launched under the leadership of Canadian Prime Minister Stephen Harper. The GFF will build on the experience, capacity and strong track record of the Health Results Innovative Trust Fund at the World Bank Group to support developing countries’ national plans for scaling up access to quality reproductive, maternal, newborn, child and adolescent health services. A unique aspect of the GFF is to support developing countries in their transition to long-term sustainable domestic financing as they grow from low- to middle-income economies. The facility is expected to mobilize additional domestic and international funds from a variety of sources, including other bilateral and multilateral donors, domestic budgets, the private sector and innovative financing mechanisms. A special focus area of the GFF will be to support countries to expand Civil Registration and Vital Statistics (CRVS) efforts toward universal registration of every pregnancy, every birth and every death by 2030. CRVS systems provide a critical accountability tool for reducing mortality and ensuring universal access to health care, education and other essential services. Consultations on the design and implementation of the GFF are now underway with countries and with key partners and organizations working on women’s and children’s health. The facility is expected to be fully operational in 2015.